Two students from Kenmare brought home two prizes from the BT Young Scientist competition for a light pollution project this weekend. Prof. Brian Espey of the School of Physics provided advice and encouragement for the project which encompassed both measurements in the centre of every major Munster town as well as a model of the light emission based on population estimates.The students, who both have an interest in astronomy and the night sky developed a model which was later turned into an app to predict sky quality for amateur astronomers. Both students plan on attending third level, with Conor interested in Physics and Astrophysics, while Hannah’s interests lie in Earth Sciences. Well done to Hannah and Conor, and their science teacher, Sarah Abbott! 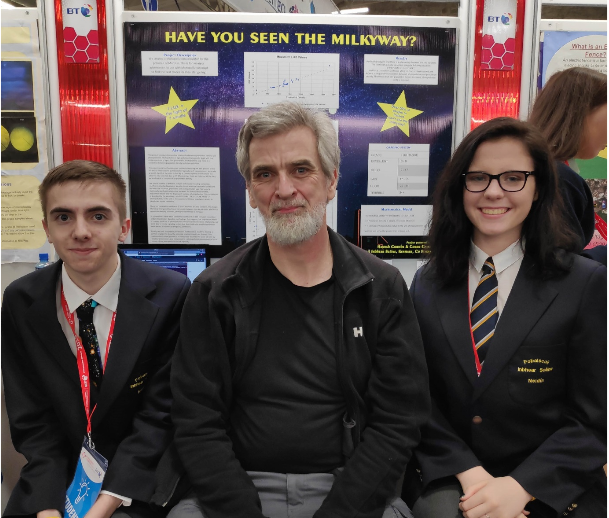 Photo: School of Physics Professor Brian Espey with Conor Casey and Hannah Coombs of Pobalscoil Inbhear Scéine in Kenmare in front of their award-winning Light Pollution project poster at the BT Young Science & Technology Exhibition.